RFID laundry management allows Fairmont to do away with manual counts and determine wash cycles and if laundry is missing. 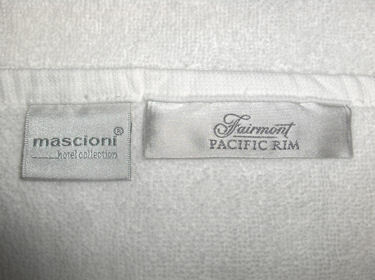 When the new Fairmont Pacific Rim Hotel opened last week in Vancouver, B.C., just in time for the Winter Olympics, it had technology in place for tracking 35,000 textile items, including bed sheets, uniforms, towels, tablecloths and bathrobes. The hotel is employing the system to track more than 8,500 items weekly as they are laundered and returned. The Fairmont hotel includes restaurants and several banquet areas that utilize textile tablecloths, as well as 377 guest rooms supplied with bathrobes, sheets and towels. The hotel has limited laundry facilities (sufficient only for staff members’ uniforms), so it sends all other soiled items to a commercial laundry in the greater Vancouver area. That means the linens leave the hotel and return only after they are cleaned, pressed and folded, making it that much more difficult to track the items’ locations and verify that they all come back. All forms of laundry are tagged ensuring accountability and tracking of wash cycles. Most hotels store a large safety stock of linens in the event that some become lost, but the Fairmont, which has a limited amount of storage space, wanted to avoid having to do so. In addition, says Younes Atallah, Fairmont Pacific Rim’s director of housekeeping, the hotel wanted to be able to track the number of times each item has been laundered, thereby helping it estimate the lifespan of its linens, based on the number of times they have been cleaned. The company also hopes to eventually receive alerts when an item has been washed the maximum number of times, thus indicating it may need to be replaced. The tags are attached to high-value items (face cloths and napkins were not included). To accomplish this, the hotel devised a small fabric patch that resembles a clothing label, with the Fairmont’s logo on the front, sewn onto the items by the hotel’s seamstresses. Inside each patch is an RFID tag encoded with a unique ID number, up to 96 bits in size. When installing the system this winter, Foundation Logic’s staff first read each tag to register its ID number in the software the linen-management solutions firm provided, and input the type of item it was—such as a robe, sheet or tablecloth—along with the date. In the future, however, Fairmont’s workers will handle that task. The information is stored in the standalone Web-based software system. When the items need to leave the hotel for laundering, they are piled in a cart that is wheeled through a doorway, where an RFID interrogator with four antennas was installed, leading to a loading dock. In a separate area of the building, employee uniforms are collected, and another reader with a single antenna was installed in a doorway to the laundry room, where those items are washed. The Impinj readers capture the ID number of every item that passes through either portal, and transmit those IDs, via a cabled connection, to the back-end system, which then stores the data, indicating the items have gone out to be laundered. When the items return from the laundry room or the commercial cleaners, they again pass through one of the portals. The software compares their tag ID numbers with those of items sent out for laundering, thereby determining that they are being returned, and again stores that information. The hotel can then run business reports that describe, for example, how often items have been laundered, the amount of time they were gone and which did not return. Within eight to 12 months, Atallah expects the hotel will begin to use the data to do such things as determine the number of wash cycles an item can sustain, and then input an alert system to notify employees when an item has reached the end of its life, so that it can be removed from the active textile pool. “Long gone are the days where you have people working overnight shifts to count every sheet,” Atallah states. Instead, the system takes that role in real time. “I would hope to see an ROI [return on investment] soon, but it will be difficult to measure,” he adds, explaining that since the hotel just opened, it does not have a previous system against which to compare. However, he expects that the hotel will lose fewer items and decrease the amount of time its staff would otherwise spend tracking inventory, thereby saving the company money. In addition, Tulman says, the hotel will not need to store as much safety stock, thus freeing up space for other storage needs.